Given the flexibility of AWS, there are multiple possible methods for how organizations manage user accounts. Each method has implications, both good and bad, that should be considered prior to granting user accounts at scale. Security and access control, cost and billing, resource sharing, and many other considerations can make a particular user management method either a great or poor fit for your organization. 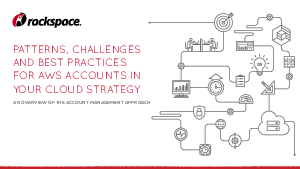 In this paper, James Cowe, Director of Solution Architecture for Fanatical Support® for AWS, will discuss methods of user account management, and the potential benefits and detriments for each approach.